So you want a PvP trinket and upgrade to the best ones available asap, but you see on the store that the Level 60 PvP trinket starts off with a trinket that requires Revered notoriety with Ridgerunner Mercenaries before you can purchase it. It can take quite a while to hit that notoriety requirement. Buy the Level 50 Conquest Trinket instead. Go to Cash Shop -> PvP -> Accessories. Then click on the ‘Change filters’ button (the two-way arrow button) next to Level to make it blank. (or set it so that you can view Level 50 gear). In the ‘Slot’ filter, choose “Trinket”. 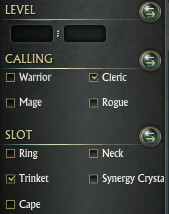 Click here for the Filter Settings (be sure to tick your Class/Calling instead if it isn’t Cleric). Now you should be able to see the below Conquest Master’s Retribution (will differ depending on your class, this is the Cleric one). It only costs 75,000 Favor (10k more Favor than the Karthan Ridge trinket which is easy to obtain at Level 60), is Level 50, requires no notoriety and has the exact same upgrade path as the Karthan Ridge trinket! Note: The Level 50 Conquest Trinket has less stats than the Karthan Ridge (Ridgerunner’s) Trinket. However, it has the same upgrade path. Thus if you don’t have close to, at, or above Revered notoriety with the Ridgerunners, it’ll be the quicker option. (remember that Notoriety progression to get to Revered is Neutral, Friendly, Decorated, Honored, then Revered. So it’ll take some time to gain the Ridgerunner’s Trinket if you are just starting out doing Karthan Ridge matches).